Located 1.4 km from Praia da Rocha beach. The Mirachoro II has a reception (24h), currency exchange, safety deposit boxes, bar, TV-room, swimming pool, children¿?Eur¿s pool, elevator and parking. The apartments have a bathroom, small kitchen,.. The Mirachoro III Apartamentos Rocha has a central location between Praia da Rocha beach and Portimao town. Mirachoro provides a free bus service to the beach at Praia da Rocha and to Portimao near the harbour. Aparthotel "Mirachouro II T1 Standard 01", 6 storeys. 1 km from the centre of Praia da Rocha, 1 km from the centre of Portimão, 1.2 km from the sea. For shared use: garden 800 m2 (fenced), swimming pool (75 m2, 01.01.-31.12.). Children's..
Apartamentos Oura by Garvetur is located in Albufeira, a 5-minute walk from the lively Oura Strip, with its many bars and eateries. The units are 200 metres from Aveiros Beach.Not aplicableTraditionalVery Small - Less than 1 groupApartamentos Oura by..
Just one of the many properties owned and managed by Garvetur, Paula Bela features holiday rentals in the form of apartment-style spaces, perfect for families and groups. Also ideal for lengthy stays and built to complete a worry-free vacation, each private.. 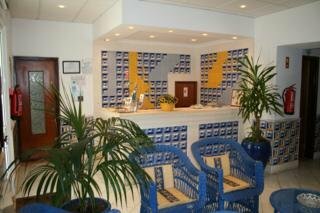 Ideally located in the centre of Albufeira, this guesthouse is just a stones throw from the beautiful sandy beaches of Praia dos Pescadores and Praia do Penedo. A large variety of shops, restaurants, bars and pubs can be found in the surroundings. Several.. Ideally located in the centre of Albufeira, this guesthouse is just a stone's throw from the beautiful sandy beaches of Praia dos Pescadores and Praia do Penedo. A large variety of shops, restaurants, bars and pubs can be found in the surroundings. Several..
General Description: Welcome to the Polana Residence Hotel in Albufeira. The hotel is located 150 m from the sandy beach. The closest cities to the hotel are Vilamoura (18 km) and Armacao Pera (15 km). To make your stay more comfortable an elevator and..